2011-12-19 19:39 SonjaM: Beautiful pics as usual, love the bright orange. Still no snow here at he We(s)t Coast. Happy Holidays and ride safely. 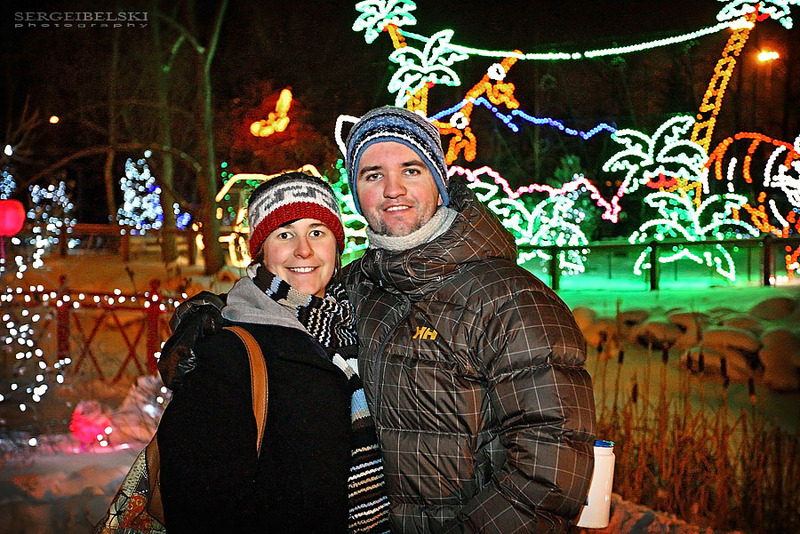 Tracy and I :) Take a look at a photo of us from 2009 at the ZooLights by clicking on this link. I spent a wonderful weekend in Banff at the Banff Springs Hotel, photographing a corporate Christmas party for IHS Inc.
2011-11-26 17:11 Maple: Was one of those pictures of Mandy? 2011-11-22 20:07 Sergei Belski: It was! Such a beautiful location... it was a great party! 2011-11-22 17:06 Tracy B! : SO MUCH FUN!!! Can't wait to see the rest of them!!! Busy weekend for me here in Airdrie. Back in 2008 I photographed a "Ring of Fire" ringette tournament and I was very happy when this year the organizers asked me to photograph it again. Photographing a tournament (in a good way) is a very very hard work and very long days, but you do end up with some great images :) Over the weekend I ended up taking somewhere between 6000 and 7000 images, big thank you to my wife Tracy, who did all the post-processing at the tournament! 2011-11-18 21:30 SonjaM: Just be careful out there the rubber doesn't warm up in these temperatures and can become pretty slick even on dry roads. Had it once happening when riding my motorcycle at minus 5C, could catch it but wasn't a fun experience. Here are some of the images from a photo workshop in Banff, AB with a world renowned celebrity wedding & lifestyle photographer Mike Colon. It was great to finally meet Mike in person and to spend some time with him... Wonderful day! On Saturday I spend some time in Olds, AB photographing a couple of volleyball games for St. Mary's University College. Here are some of the photographs from Friday's hockey game that I photographed for Mount Royal University, where Cougars played against Vikings from Augustana University College. Even if I'm not a huge hockey fan, It was a high scoring game and interesting to watch. Last Sunday I photographed ACAC soccer finals. I love playing, watching, and photographing soccer, so I was very happy when Mount Royal University told me that they will be hosting finals and that they would like for me to photograph it. It was nice to see some larger than usual crowds at a university game, also people made a much nicer background for my photographs instead of having empty stands. 2011-11-06 22:29 Sergei Belski: Thank you James! Lately I have been shooting sports without strobes, I find that I get more different angles and better moments that way. When I do shoot with strobes I always bounce them of the celling. Depends on the sport and on the place where I'm shooting, I use 4 AB1600 and 2 AB800 with 11" reflectors. 2011-11-06 20:22 James: Hi Sergei, your pictures look awesome! I am myself the photographer for the University of Montreal and it's good to see great pictures like these from a fellow photographer. I looked at your volleyball pictures also. I just started shooting with strobes this week. I use 2 AB800 and 2 Einsteins with 11'' reflectors bounced at the ceiling. I will be trying it for hockey soon but was wondering if your setup was bounced at the ceiling or aimed at the ice? Keep up the good work! 2011-11-04 06:48 Tracy B! : Love the pics, they feel so natural & casual!! I thought my fave was going to be the boy by himself against the red background, but I LOVE him walking along the log with his mom!!! Here are some photographs from a couple of volleyball games I photographed for Mount Royal University on Friday night. 2011-11-02 09:03 Tracy B! : Love the overhead team photo!!! P.S. Is the coach blocking his face to better project or so the other teams' coach doesn't see/hear?